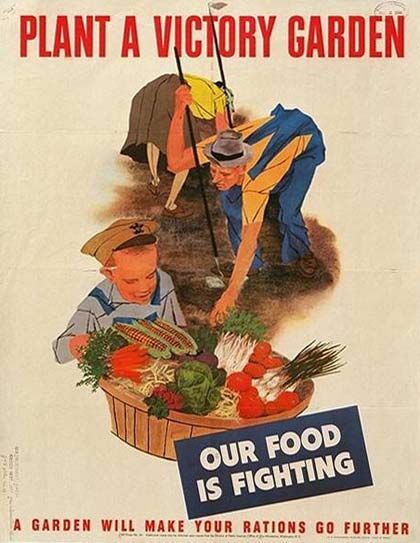 Historic Poster: Dig for Victory! blog about it. Seems like these days every sprig of parsley grown within sight of concrete has to be documented. Well, here I am to wax poetic about my own sprigs. I have a 4 ft by 40 ft raised bed on the south side of my house, and wanted to pay homage to my Sicilian great grandmother who was an actual farmer. What she would think of my efforts… I have to imagine her kind heavenly laughter. Early on, a neighbor asked if she could plant some herbs in a corner somewhere and our “community garden” was born. Rebecca’s sister raises horses, so our first activity was to rent a truck and fill it with manure. And hay bales (more on those later). We harvested my compost pile, bought peat moss and perlite, and set about amending the soil in the raised bed. Marked off into 4 x 4 sections, each plot was dug up to a depth of about 6 inches and dumped into a tarp with scientifically measured amounts of manure, compost, and the other ingredients. We mixed the soil by holding the corners of the tarp like a sheet and heaving it back and forth between us, then dumping it back in and smoothing it out. It was beautiful soil, certain to yield bounties of food. The bales were a bit of an experiment: in places where there is contaminated soil or none at all (such as urban brownfields and lots), straw bales are set up and compost piled on top of them for a growing medium. Behind our garage is a sunny spot, but the ground is made completely of heavy clay. We set up the bales back there, wet them down with fertilizer and let them sit so that they wouldn’t get so hot as to burn the tender roots of our seedlings. I didn’t know how to test when the bales were cool enough, so I dug out a meat thermometer and stuck it in. It registered below 200 degrees. Was that right? Who knew–we planted. We learned that some seeds need to be soaked before planting (peas, beans, corn), and that corn was grown by Native Americans using the “Three Sisters” method of planting it along with beans and squash (which we did). We used trellises to take advantage of vertical space, planting cucumbers up on a grid while growing spinach and lettuce in the cooler shade below. There were mistakes made. An over-eager rookie, I planted way too many seeds without enough space between them and then was reluctant to thin the rows. This resulted in radishes that crowded each other so badly that eventually I pulled them all out and started over. But this way we ended up with radishes into the fall. We had so many cucumbers I tried my hand at pickling. Using my 1935 Fannie Farmer cookbook, I essayed dill and bread-and-butter, with results that will probably end up in the compost pile. We also installed rain barrels, but without raising them on cinder blocks, there wasn’t enough gravity to get a good water pressure in the hose. So we used them mostly to fill the watering cans which we hauled back to the straw bales. There were victories too. Every week I’d harvest and fill three bags with produce: one for us, one for Rebecca, and one for the upstairs neighbors. I’d bring food to my parents. One night, Rebecca and her husband, and me and mine, had dinner on the patio overlooking the garden. Almost everything we ate we had grown ourselves: the ingredients for the salsa (not the chips), the pesto (not the pasta), the chopped salad, the baked squash, the corn. I made several batches of ratatouille over the summer, and Rebecca perfected squash blossom quesadillas. I loved looking at my dinner’s raw ingredients, all washed up and waiting on the cutting board: the emerald green pepper next to the royal purple eggplant, the little white stars of the patty-pan squash, the abundance of plump tomatoes, rich orange-red or the burgundy of the heirloom Black Krim, a pile of basil leaves scenting the air. It made me feel so fortunate. Overall did it cut down on our grocery bills? When all the initial investment was calculated and weighed against the amount of food we got, I think we were eating ten-dollar carrots, but dammit they were OUR carrots (and grated with some currants and dressing, they were delicious). I loved knowing that they had traveled a total of about 50 feet from “field” to plate. It’s amazing to be fed from your own piece of earth. The scourge of the summer was the spider mites, which attacked towards the end of the season, decimating the tomato plants no matter what I did. When it came time to put the garden to bed, I couldn’t use the infested plants in the compost pile and had to send them to the municipal compost (where the temperature gets high enough to kill the eggs, etc). Talk about “murdering your darlings.” I felt terrible pulling up the jungle of tomato vines, tearing them apart, cramming them by the armful into leaf bags. These plants I’d started from seed, tended on the windowsill when they had one leaf and one tiny root, transplanted to the greenhouse, then to the garden when they were strong enough, staked up, watered daily, and watched grow. I thanked them for feeding me as I pulled up the thick stems and vines that seemed to go on forever. I pulled up the eggplants which also valiantly fought off the spider mites to continue to put out new leaves, the bell-like flowers, and such beautiful fruit, purple and white. The plants gave off a peppery smell as I tugged them up out of the earth. I felt worst about a small green bean plant: I ate the last three beans–surprisingly still juicy—thanked the plant, and pulled it up. Soon Rebecca and I will be plotting next year’s garden, or—I heard this on some other blog—“farmlet.” We’ll grow some of the same varieties, and skip the ones that didn’t do so well (the cantaloupes smelled great but were too watery to be edible). The peas and beans seemed fried by the full sun they got, and need a shadier spot. The corn took up too much space for its yield; we may give that space to strawberries this time, or potatoes. As we plan, I think of the “red wrigglers” I added to the compost pile this fall. Sold by the pound by the “Worm Ladies” of Charlestown, they eat twice their body weight of kitchen garbage each day and supply superior castings (poop) to fertilize the soil. Before it got cold, I bedded them down with feathers from an old pillow (yes, those are compostable!) and a generous layer of leaves. Even now, when the garden is covered in a foot of snow, we are planning, and the worms are working. Waiting for spring.